“Wife” of presidential candidate Pigasus after eluding police. John Bowden, courtesy of the DC Public Library Washington Star Collection © Washington Post. It was 1969 and thousands were streaming into the nation’s capital for a Presidential Inauguration…but this time they weren’t planning on throwing confetti. It was the height of the Vietnam War and many were coming to the first organized protest at an Inaugural ceremony in the country since a small group of unemployed workers staged a counter-parade at Franklin Pierce’s in 1853. Instead of flowers, horse manure would be tossed at Vice President Agnew’s guests dressed in their finest gowns and tuxedos. Rocks, tomatoes and smoke bombs would be hurled at newly sworn-in President Richard M. Nixon as his motorcade drove along Pennsylvania Avenue. Antiwar demonstrators planned to symbolically “In-HOG-urate” a pig as president and hold their own counter-inaugural ball on the National Mall. 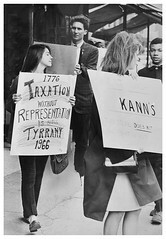 The domestic anti-Vietnam war movement was foundering in the fall of 1968. That was a stunning turnaround, as victory had appeared to be within the grasp of war opponents only months before. Two years of mass demonstrations against the war had peaked in October 1967, when more than 100,000 people had streamed into the Washington, DC area for a march on the Pentagon. Local protests were common on campuses and in towns across the country. Then in January, 1968, nearly every city in the Republic of (South) Vietnam was hit by an uprising of forces of the National Liberation Front aided by military forces of the Democratic Republic of (North) Vietnam. A vocal minority was no longer the sole group questioning the war. An antiwar candidate, Senator Eugene McCarthy (D-MN), entered the race for president and nearly beat the incumbent Lyndon Johnson in the New Hampshire primary of March 12, 1968 with the help of hundreds of college students opposed to the war. Senator Robert F. Kennedy, whom many regarded as an even stronger candidate, entered the race shortly afterwards. On March 31, Johnson conceded, “I shall not seek, nor will I accept” the nomination for president. Kennedy was assassinated on the night of his California primary victory in June, 1968, and Vice President Hubert Humphrey went on to win the Democratic nomination after a Chicago convention that featured brutal suppression of antiwar demonstrations by Democratic Mayor Richard J. Daley. The Republican Party nominated Richard M. Nixon. 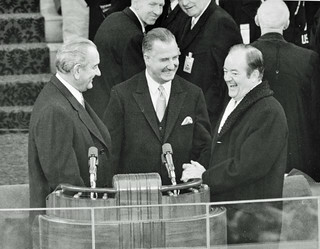 Johnson, Agnew & Humphrey share a laugh during Inaugural ceremonies. Photo: William C. Beall, courtesy of the DC Public Library Washington Star Collection © Washington Post. In a matter of months, the fortunes of the antiwar movement had been reversed. The positions of Nixon and Humphrey on the war were virtually identical. The movement believed it had forced Johnson to resign only to get two candidates in favor of further continuation of the war. On the left, Marxist groups were gaining sway, advocating revolution and the abandonment of electoral efforts. Other antiwar activists were simply discouraged. 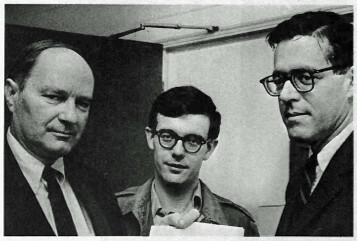 The steering committee of the National Mobilization Committee to End the War in Vietnam (MOBE), a broad-based coalition that had sponsored the earlier demonstration at the Pentagon and many of the protests at the Chicago Democratic Convention, met on September 14, 1968 in Washington, DC to consider the next steps. The attempt at a strike during the presidential election failed, with no campuses shut down and only a few relatively small demonstrations staged in major cities. In Washington, DC, over 1,000 rallied near the Lincoln Memorial and marched without a permit to Lafayette Park—attempting to implement a more confrontational approach. However, the small turnouts and limited effectiveness of these actions across the country led to more disillusionment. After this failure, the MOBE regrouped and began to backtrack on using the politics of confrontation. The MOBE leadership wooed other organizations that had not previously participated in MOBE activities. These groups had viewed the coalition as too radical. In response, SANE (Committee for a Sane Nuclear Policy), The University Christian Movement and the Universities Committee on the Problems of War and Peace agreed to participate in the counter-inaugural activities along with other pacifist groups. A significant portion of the antiwar movement was opposed to MOBE’s counter-inaugural at this point, including the national leadership of the Students for a Democratic Society (SDS) that voted in December against participating in the protest. A number of other left wing groups decided to sit it out as well. Seeking to avoid physical confrontation, MOBE representatives entered into complicated negotiations with the government over permits. As the negotiations approached the start of Inaugural activities, a breakthrough was reached on January 15. The government agreed to permit the counter-demonstrators to march from the national Mall near the White House along Pennsylvania Avenue to the Supreme Court on the day before Nixon’s parade. Congressional leaders later vetoed any use of Capitol Hill, so the ending point was changed to the national Mall near the Health, Education & Welfare (HEW) building at 3rd & Independence SW.
Erecting the counter-inaugural tent. Photo: uncredited, courtesy of the DC Public Library Washington Star Collection © Washington Post. 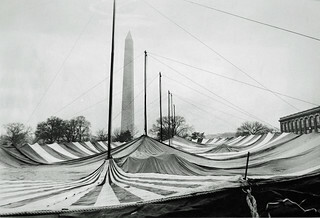 There were no meeting facilities available to the protestors in the city, so the MOBE demanded permission to erect a tent on the Mall to accommodate the counter-inaugural activities. 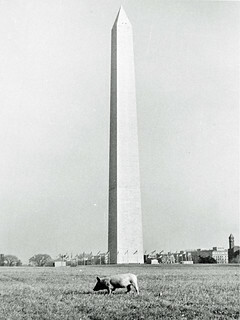 Ultimately a compromise was reached on January 16, and a grassy triangular area south of the Washington Monument and west of 15th Street NW was agreed upon. But Dellinger didn’t have the final word on the escalation of tactics as groups and individuals began making their own plans. 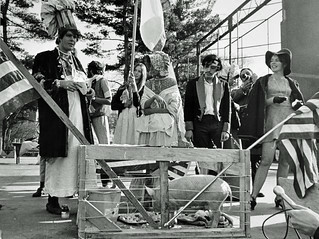 On January 16, a small guerrilla theater group arrived at the outdoor Sylvan Theater on the Monument grounds, where one participant identified as Super Joel Yippie presented a live pig as “Mrs. Pigasus,” the wife of Pigasus who had been nominated for president during the Chicago convention protests. Reception for Ms. Pigasus. 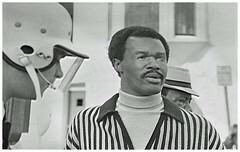 Photo: John Bowden, courtesy of the DC Public Library Washington Star Collection © Washington Post. The protestors vowed to “In-HOG-Urate” Pigasus with Ms. Pigasus at his side at the counter-inaugural protests scheduled in a couple of days. In an event seemingly related to the protests, a Molotov cocktail was tossed through a window of the national Selective Service headquarters at 1724 F Street NW just after midnight on January 18. Police reported that the firebombing caused “extensive damage” to the records of the headquarters of the nation’s draft board, according to the Washington Post. The first official counter-inaugural events took place on January 18th. At the Hawthorne School, located at 501 I Street SW, hundreds watched a Black Panther film, discussed labor organizing, traded tips on draft counseling, and learned the fine points of guerrilla theater at the many workshops offered. “Distinguished Ladies” protest. Photo: unidentified, courtesy of Liberation News Service. 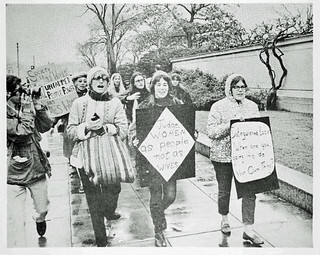 Later, approximately 150 women gathered at the National Gallery of Art in a demonstration sponsored by the Women’s Liberation Movement and attempted to break through police lines to enter a reception for “Distinguished Ladies” being held there. During the first attempt at confrontation politics during the weekend, the police lines held and no arrests were made. Meanwhile, inside the reception three women who had obtained tickets handed out leaflets and gave an impromptu women’s liberation speech to a crowd that included Tricia Nixon, the president-elect’s daughter, and Randy Agnew, the vice president-elect’s daughter. Another three hundred shouted at attendees of a “Young Americans Inaugural Salute” scheduled by the Young Republicans at the Washington Hilton hotel. 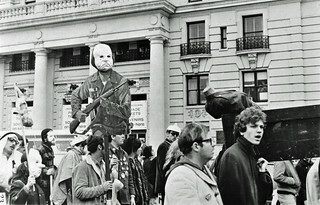 A guerrilla theater group wearing white rubber Nixon masks imitated the Gestapo and tore apart and burned a rubber doll while chanting “Kill for Peace.” One man who pulled down some red, white and blue bunting at the hotel was arrested for “mutilation and desecration” of a flag and was later sentenced to 30 days in jail or a $100 fine. The following day, demonstrators began gathering at the counter-inaugural tent on a cold and rainy day. Inside the tent, the ground turned to mud. A parade of male speakers came to the stage, broken up by an occasional folksinger like Phil Ochs, while the crowd became restless. James Johnson, one of the Fort Hood 3–a GI who had refused orders to Vietnam–was heckled. Moderator Dave Dellinger, a long-time antiwar leader, stepped to the microphone and rebuked the hecklers. The MOBE leadership had invited Marilyn Salzman Webb as one of the official speakers who would address women’s liberation. Webb, a veteran civil rights and antiwar activist who was a Washington, DC women’s leader, was reluctant to openly criticize the male dominated antiwar leadership. 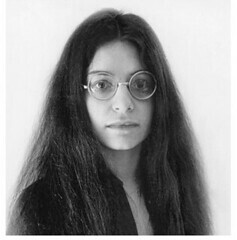 Shulamith Firestone circa 1970. Photo: Michael Hardy. Another branch within the nascent women’s movement, led by Shulamith Firestone of New York, demanded and won the right to speak to the crowd. Firestone planned to direct some of her remarks to the subjugation of women by those in the New Left. As Webb began her speech, hecklers began shouting, “take it off” and “take her off the stage and f*** her,” according to Alice Echols’ account. Webb recalled later, “It was like a riot breaking out.” When Firestone tried to speak it was worse. Webb recalled that there were some men in the audience who were opposing the hecklers. For the women, a problem bigger than the crowd was Dellinger’s response. Rather than trying to calm the crowd as he did with the Fort Hood speaker, Dellinger told Webb to “shut Shulie up,” according to the account by Echols. Webb was ostracized from the Washington, DC SDS community after her relatively mild speech. She went on to start the feminist journal Off Our Backs with others. 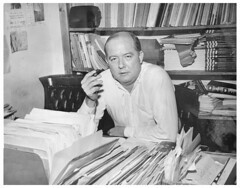 Webb later reflected that the events forced women to forge their own politics, but deprived them of a base, “The left could have been a base and was a base, because that’s where we all came from…” according to Echols account. The incident highlighted the weaknesses of MOBE officials that vacillated on many issues and often exercised little or no leadership. Not long after the women left the stage, a group of New York SDS members approached the podium and asked to speak, but were refused. Angered, they walked out and began an impromptu march. Rally prior to the march inside the tent. Photo: uncredited, courtesy of the DC Public Library Washington Star Collection © Washington Post. “Inside the tent, the speakers were shooting their mouths off saying nothing that we hadn’t heard a thousand times before and everyone wanted to get out of there. They just wanted to go and they started going,” one participant said, according to a government report on the activities. The main march, drawing upwards of 15,000, proceeded not long after the rump group on Pennsylvania Ave. toward the Capitol. There were no incidents until protestors encountered a group of right-wing counter-demonstrators. The Nazis were quickly driven off. The counter-inaugural parade was mostly festive with street theater and marching kazoo bands. The signs and banners reflected a variety of issues with an end to the Vietnam War paramount. Nixon as a war criminal during counter-inaugural march. Photo: uncredited, courtesy of the DC Public Library Washington Star Collection © Washington Post. Abolish the Draft,” “Free Political Prisoners,” “End the War,” “Bring the Boys Home, “Don’t Eat Grapes,” “Defeat Imperialism Everywhere,” and “Victory to the Vietcong” were among the messages carried by the marchers. A brief confrontation occurred toward the end of the march near 3rd Street, Independence Avenue and Maryland Avenue. Police attacked some demonstrators who they believed were trying to march on the Capitol. Demonstrators responded by throwing sticks and bottles at the police before MOBE marshals formed a line between the two groups, siding with the police against the protestors in the view of many of the crowd. Police arrested fifteen during this confrontation. Another brief scuffle occurred at the HEW building at the end of the march when some demonstrators tried to pull down an American flag in front of the building. MOBE marshals circled the flagpole and prevented this from occurring, but several fistfights between demonstrators broke out over the issue, further underscoring differences among the demonstrators. MOBE leaders eventually convinced authorities to lower the flag since it was around 5 p.m. and getting dark anyway. Several thousand marchers began walking back along the Mall to the tent for the counter-inaugural ball. Protestors began gathering near the Mall entrance of the museum (now Museum of American History) on Madison Drive in another impromptu demonstration. Police using horses clear Agnew demonstrators. Photo: US Park Police. 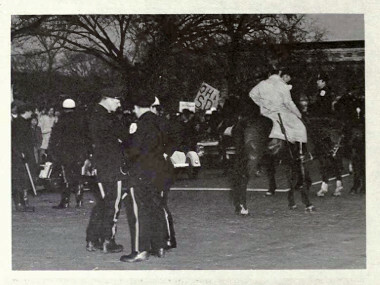 Park police, using horses for the first time in a Washington demonstration, drove the protestors back from the immediate area of the museum entrance onto grassy areas on either side of 13th Street. The use of horses would prove to have mixed results. A few firecrackers were hurled at the horses who in turn reared up and nearly threw the officers to the ground. As time went on, horses began dropping manure. Dressed in mink and formal clothes, Agnew’s guests began arriving and contrasted sharply with the demonstrators. The guests were forced to walk a gauntlet, greeted with shouts of “fascist pig” and “imperialists.” And that was not all they were greeted with. There were only a few foot police present and there had been no further attempt to move protestors. As the seventh couple arrived, the man smiled, probably attempting to look unconcerned at the mayhem around him. However, when a firecracker exploded near his wife’s arm, police began moving the crowd back and also making several arrests. As objects continued to be thrown, police attempted again to move protestors back. This time they lost control and began clubbing people. The police horses trampled several protestors. The demonstrators began fighting back with rocks and sticks and ultimately their fists. Horses move protestors back at Agnew reception. Photo: US Park Police. They succeeded in clearing the area after a few minutes and afterwards Agnew’s guests could arrive with little danger of being struck by objects thrown by the crowd. 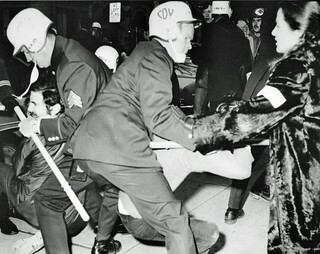 The fighting was largely over and Agnew arrived at some point, skirting the protestors by entering a side door. However, one protestor who had taken refuge in a tree during the altercation with police was repeatedly clubbed with a three-foot riot baton by a man in a police slicker and a riot helmet. The incident took place in full view of the crowd. The “policeman” was later identified as a part-time police surgeon who was not authorized to wear a police uniform. Shortly after this incident, a deputy chief of police went alone into the crowd to investigate some small fires. A demonstrator struck him in the back of the head with an improvised wooden club. Two other officers came to his aid and helped him back to police lines. With nightfall, the falling temperature took its toll on the demonstrators and they began to filter away. When Agnew left the reception around 6:45 pm from another door, the rest of the crowd moved to the tent for the counter-inaugural ball. 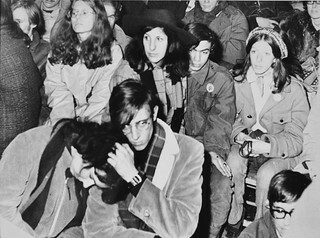 As a light show beamed across the stage, rock bands, including Ed Sanders and Tuli Kupferberg of the Fugs, and folk singer Phil Ochs entertained the crowd. Marijuana was smoked openly in the presence of the numerous undercover police officers. Counter-inaugural ball January 19. Photo: Geoff, courtesy of the DC Public Library Washington Star Collection © Washington Post. Co-Aim seized the headquarters of the MOBE on Vermont Avenue and another group went to the tent and took the microphone about 11 p.m. to announce a march from Franklin Park the next day at noon, urging those with “weak stomachs” to stay away. After a long discussion between MOBE officials and the group’s representatives, a compromise was reached. MOBE would seek a permit for the group while the militant demonstrators agreed that their march, if permitted, would not be disruptive. The permit for the ball allowed demonstrators to stay all night at the counter-inaugural, but few remained after midnight in the cold, muddy tent. The In-HOG-uration of Pigasus never actually took place and Ms. Pigasus never made another appearance either. The next day several hundred people gathered in Franklin Park and were joined by many others in route during a march from the park to Pennsylvania Ave. There were several skirmishes with police and counter-demonstrators along the way that resulted in several arrests. March from Franklin Park to Pennsylvania Avenue. Photo: uncredited, courtesy of the DC Public Library Washington Star Collection © Washington Post. The group gathered at the widest point on the Inaugural Parade route between 14th and 15th Streets NW, on the north side of the avenue in front of the National Theater. Freedom Plaza had not been constructed at that time and Pennsylvania Avenue ran closer to the theater than it does today. Another group of about 1,000 protestors gathered on the other side of Pennsylvania Avenue closer to 15th Street, where the motorcade would make a turn. The MOBE bought 200 tickets to the official bleacher seats on Pennsylvania Avenue and on 15th Street. Demonstrators filled those with varying signs and banners as well as flags of the insurgent Vietnamese National Liberation Front. Still another group of several hundred gathered at 12th & Pennsylvania Ave. NW in front of the American Security Building. Individual protestors were scattered along the parade route. The area in front of the National Theater was the scene of intense skirmishing between police and protestors prior to the motorcade. Police were outraged that the demonstrators were burning small American flags given out by the Boy Scouts, and would periodically reach across the steel cable barrier to grab and arrest a protestor. One man who wrapped a small flag around his fingers and raised them in a “V” sign was later convicted for flag desecration and sentenced to 60 days in jail. Protestors threw objects at the police, who occasionally responded by charging into the crowd. One officer had his cap taken when he tried to tackle a demonstrator burning a flag, and a police captain was clubbed over the head when he entered the crowd alone to put out a small pile of burning flags. Johnson, Nixon, Rev. 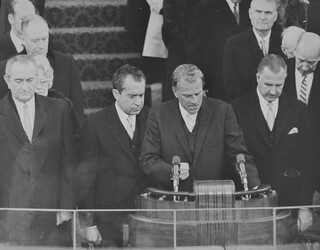 Billy Graham & Agnew pray at Inauguration. Photo: William C. Beall, courtesy of the DC Public Library Washington Star Collection © Washington Post. The Nixon motorcade began to make its way from the Capitol, where he had been sworn in, to the White House reviewing stand, and authorities acted to ensure there would be no parade disruption. “Approximately fifteen minutes before the parade reached the intersection which the crowd occupied, units of the C.D.U. [Civil Defense Unit – the riot squad] moved into position behind the demonstrators. Units of the Regular Army 82nd Airborne from Fort Bragg, in dress uniform, formed a line behind the police and linked arms. They carried no rifles. Two companies, totaling approximately 200 National Guardsmen, were ordered to 13th and Pennsylvania from their position behind the District Building. Wearing battle gear and carrying rifles, they lined up shoulder-to-shoulder next to the Army troops. Tension among the demonstrators mounted,” according to a government report made after the demonstration. Nixon was riding in a black bulletproof limousine with the top affixed and had the windows rolled down for most of the parade. As he passed the demonstrators at 12th Street, he waved to the crowd opposite the demonstrators from an open window while the windows facing the protestors were closed. However, all the windows on the car were closed as it moved toward the main body of demonstrators. Secret Service duck rocks while one jumps on back of Nixon limousine. Photo: uncredited, courtesy of the DC Public Library Washington Star Collection © Washington Post. As the Presidential car approached 14th Street, a smoke bomb was tossed seconds before the car passed. A thrown missile felled a National Guardsman. Two cans with smoke coming out were thrown at the President’s car. One landed in front of the car while the other rolled underneath. A rock did hit the side of the car and a Secret Service agent was struck near the rear of the car. Another batted down a bottle. The official count was twelve hard objects and many softer ones such as tomatoes and tin foil. After the Presidential car passed, the demonstrators who were gathered in front of the National Theater began moving toward the area of the White House reviewing stand by heading north on 14th Street and then west on H Street, while most other protestors at the parade dispersed. Fighting between police and demonstrators broke out on H Street near Lafayette Park, with police clubbing demonstrators. The fracas took place within shouting distance of the President. As the clash continued, about 200 African American young people, drawn to the area by the commotion, joined the predominantly white protestors in the battle. CDU police grapple with demonstrators after Inaugural Parade. Photo: Geoff, courtesy of the DC Public Library Washington Star Collection © Washington Post. A running battle soon developed with demonstrators throwing rocks and bottles and police arresting anyone who looked like a protestor. Police soon lost control. They beat a young woman medic who was administering first aid. A city official restrained another officer from chasing an 11-year old boy. The official then took the child to a nearby church. Still another officer repeatedly clubbed an 18-year old woman with his nightstick. The police surgeon who beat a demonstrator coming out of a tree the night before was back again clubbing anyone who came near him. Demonstrators fought back with rocks, bottles and fists in running battles that frustrated police, including a contingent on scooters. Helicopters circled looking for groups of demonstrators. As these skirmishes drew to a close, the deputy chief in charge of the CDU was told 90 arrests were made. “Not near enough, not near enough,” he replied. The counter-inaugural protests were over after three days of confrontation. 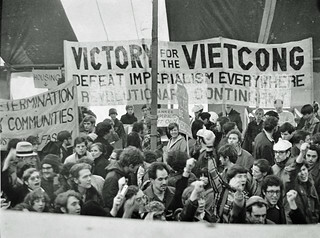 Following the brutal suppression of antiwar demonstrations in Chicago the previous summer, the failure of a national strike on Election Day in November, and the disillusionment with the election of a president vowing to continue the Vietnam War, the protest served notice that opposition to the war would not die. Giving Nixon the kazoo during counter-inaugural. Photo: uncredited, courtesy of the DC Public Library Washington Star Collection © Washington Post. In the end, the injuries to police and demonstrators were minor and while some were treated at area hospitals, no one required hospitalization. Police reported a total of 119 arrests over the three-day period of the demonstrations. Authorities were also pleased because their worst fear of protestors breaking through barriers and overturning the President’s car was not realized. 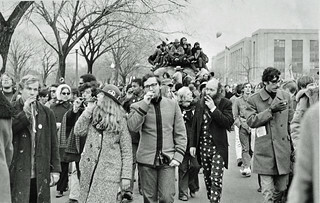 Despite the weaknesses of a demonstration that was poorly organized and led and of a movement that would splinter into a hundred different tendencies, the counter-inaugural activities served to revitalize the antiwar movement and sharpen the debate over moving from passive resistance to active opposition. 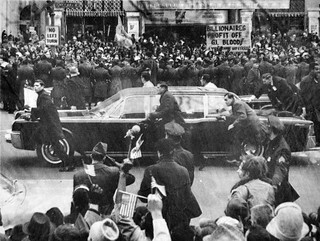 Peace sign & middle finger as Nixon’s limo passes demonstrators reflect debate at 1969 counter-inaugural. Photo: uncredited, courtesy of the DC Public Library Washington Star Collection © Washington Post. The debate among demonstrators wasn’t as simple as violence versus non-violence. It was more about whether the antiwar movement would adopt confrontation tactics on a widespread scale. The debate was largely won by those who sought an escalation of tactics, as millions joined the moratorium, a national strike against the war, on October 15, 1969, followed by a huge national demonstration in Washington, DC on November 15 of that year. In 1970, students at more than 500 campuses across the country went on strike against the war for several weeks. In 1971, thousands more streamed into Washington in an attempt to shut down the government. 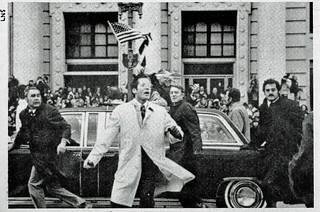 Nixon’s limo is again pelted with rocks at 1973 Inauguration. Photo: Liberation News Service. Nixon began withdrawing combat troops in response to the continued shift of the US public opinion from pro-war to antiwar and the ongoing fighting by the Vietnamese. He soon entered into negotiations with his Vietnamese adversaries. However, he increased aerial bombing, and over the Christmas holidays in 1972 he staged the largest US bombing since World War II against infrastructure in the Democratic Republic of Vietnam. This was met by a demonstration involving nearly 100,000 people at his second Inauguration in January, 1973. Once again his limousine was pelted with rocks during his Inaugural Parade. The US combat role in the war ended with the Paris Peace agreements shortly afterwards. The quotes that are offset in this article are from my own recollections entitled, “My Most Memorable Antiwar Demonstration” written for a reunion of University of Maryland activists in 2005. Most other information for this article was compiled from The Washington Post, The Washington Star, The Daily News, The Baltimore Sun, The Washington Free Press, Echols’ “Daring to be Bad: Radical Feminism in America 1967-1975, Liberation News Service and a staff report by Joseph Sahid, et. al. for the National Commission on the Causes & Prevention of Violence. At the time of this demonstration, I was a 17-year old high school senior and attended nearly all of the activities described. My own recollections of specific events largely parallel the National Commission on Causes and Prevention of Violence staff report with several minor differences. Liberation News Service also provides three accounts that do not differ substantially. There were no media reports of the altercation with the American Nazi Party January 19, but two of my high school classmates were directly involved and I and other friends witnessed the end of the encounter. There were no press reports that horse manure was thrown at arriving guests at the Agnew reception January 19. However, others who were present at the event have confirmed my recollection. The staff report relied on news media reports of “mud” being thrown. My recollection of a police officer’s gun being taken during the confrontation at the Agnew reception on January 19 is probably wrong. I may have mistaken some other object as the officer’s gun since there were no reports of a missing service weapon. The staff report implies that objects hurled at the President’s limousine only came from the north side of Pennsylvania Avenue near the National Theater on January 20, but objects were tossed from both sides of the street. My recollection that no objects hit the President’s car is contradicted by the staff report that indicates that one rock struck the vehicle. I recalled the limousine speeding up as it approached the main body of demonstrators at 14th Street and this is confirmed in a Liberation News Service account, while the staff report has the vehicle doing a steady 3-4 mph. See more photos related to the 1969 counter inaugural activities here: and of the 1973 protests at the inauguration here. Coming soon: A link to a footnoted version of this article. Thanks for writing and researching this fascinating, troubling, and detailed, account. I especially appreciate the documentation of the misogyny of New Left leaders (including, sadly, Dave Dellinger) and the emerging feminist response. I hadn’t known, for example, that the fantastic radical feminist paper, Off Our Backs, which I subscribed to for years, emerged from these experiences. It’s a valuable and instructive piece of research, and I appreciate all the work you did to corroborate your memories with other sources. There’s a couple historical mistakes I saw regarding long-term historical issues. You claimed that this was the first counter-inaugural since Pierce’s in 1853, but this omits probably the most important and effective counter-inaugural ever: the women’s suffrage parade of 1913 (see, for example, this Atlantic Article (http://www.theatlantic.com/photo/2013/03/100-years-ago-the-1913-womens-suffrage-parade/100465/), or this Library of Congress page (https://memory.loc.gov/ammem/awhhtml/aw01e/aw01e.html). Second, you claimed that this was the first use of horses in Washington DC against protesters. But the Bonus “Army” was dispersed by US cavalry, led by MacArthur and Patton, in 1932 (see, for example, http://www.historynet.com/the-bonus-army-war-in-washington.htm, and http://www.npr.org/2011/11/11/142224795/the-bonus-army-how-a-protest-led-to-the-gi-bill). Thanks for the comments, Sam. I think they help provide historical context that wasn’t provided in the blog post. On your first point, I agree that the way this post was written was misleading and information about the 1913 march should have been included to provide context. 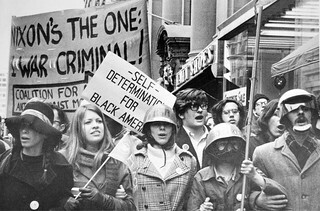 The point I was trying to make (and I agree did not) was that that this was the first protest at an Inaugural Parade. The 1913 march (like the counter-inaugural march) occurred the day before the official Inauguration. The parade route protests are the first I know of since Franklin Pierce. If you or others have any information to the contrary, please provide it so we can set the record straight. On your second point, your facts are also correct. 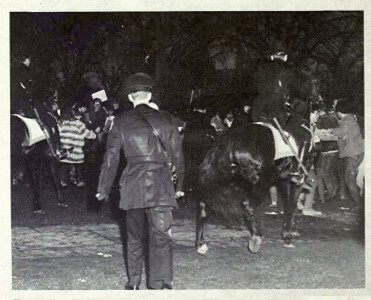 In addition to the use of U.S. Cavalry at the bonus march, District of Columbia police had a mounted unit that was used for crowd control in other demonstrations such as the Hunger Marches of 1931-32. The point I was trying to make was that this was the first time U.S. Park Police used horses at a demonstration and their inexperience cost them. Thanks again helping to put the Nixon protests in context by adding additional information and helping to clarify the points I was trying to make. I am commenting on the issue of the feminist speaker(s) at the event, and women’s roles in the anti-war movement in general. I was at the Counter Inaugural Ball and many of the protests of the time. I was 17 at the time, a HS senior facing the military draft when I turned 18 in August of 1969. The vast majority of anti-war protesters from my observation were young men. Maybe that was natural since young men were the ones facing being drafted and sent to fight in an undeclared war we were against. That was what had motivated us to protest the inauguration of Nixon, and turn out for these related anti-war events. While most of us probably also supported other civil liberties movements, civil rights, women’s liberation, etc., some of the feminists of the time came off as anti-male, sexist in their own way, against men as a whole. Yes, perhaps is understandable, but it often caused a push-back from men. Being an anti-male feminist is just as wrong as sexism against women by men, isn’t it? So when a crowd of mostly men is gathered at an anti-war rally facing a life or death situation, being drafted into a war, it may not be the best time or place for a feminist speaker to get up and start blaming us, mostly unjustifiably so in our opinion, for society’s unfair treatment of/discrimination against women. Angry people, men and/or women do not make for rational discourse usually. From my 17 year old male perspective, that was why the feminist speakers were not well-received. I agree some of the heckling of them went over the line, however. But taking them off the stage was probably the right decision under the circumstances. Excellent post, Chris. Your points make great, good sense. Thanks. Many people, sadly, really did go to excesses during that period, which contributed a great deal to many legitimate movements folding back on themselves, and ushering in a more right-wing regime. This is kind of the same thing as what happened in many of the European countries, as well. Is a flat lie. I was there. I was a member of the Department of Defense photographer’s team, and can prove it. I arrived at the Capitol about 6:00 AM, well in advance of anyone else. I filmed the entire inauguration, and I packed up and left about 2:00 PM after the plaza on the east front of the building was cleared. I walked the entire parade route. I did not see even ONE protesting group. Not one, anywhere along the parade route and certainly not at the ceremony. That evening there were pictures of protestors taken against un-identifiable backgrounds shown on the news; and the following day in the papers. These people were NOT, repeat NOT, in evidence anywhere at the ceremony or along Pennsylvania Avenue. Not even one. That this lie has been perpetuated for more than 40 years is a dsigrace to the “news” media, and testimony to their fundamental dishonesty and disloyalty to the USA. As much as they hated Richard Nixon, though, no doubt the vitriol–which is much worse now than in 1973–will be directed against President Trump with even greater zeal. I repeat: as an eye witness I can assert that there was NOT ONE protest at the inauguration nor along the parade route in 1973. I don’t expect that my objection to the lie means that it will be retracted: but it remains a lie. I was there. I suppose I could call you names, but I realize that memories are tricky things and need to be backed up by facts. I’m sorry you feel like all the news media in the country was telling a lie and only you are telling the truth. 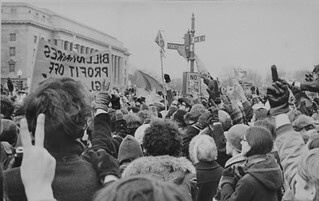 Protesters gathered at the intersection of 15th and Pennsylvania Ave NW during the 1973 Inaugural parade. It’s a fact. I’m sorry that you feel the need to deny it. Certainly the protesters dispersed after Nixon’s limouisine passed, so maybe you just weren’t at the location at the time Nixon passed or perhaps your memories are just wrong. Eugene McCarthy was a Democrat from Minnesota, not Wisconsun.